Each year the wild flowers appear from late March to October, and peak in August and September. In the centre of this floral phenomenon lies the historical settlement of Nieuwoudtville, the base from which to explore the numerous other attractions in the area. The locals have proudly dubbed it "the bulb capital of the world", and they aren't kidding. There are bulbs everywhere - in gardens, farmyards and fields, along the roadsides and hidden in every nook and cranny. But we're not talking light bulbs, bulbous bows or the business ends of thermometers, oh no ladies and gentlemen, we're talking Ixia, Sparaxis, Gladiolus, Tritonia et al - the largest variety of indigenous bulbous plants in the world and an annual flower bonanza that draws botanists, photographers and tourists from all around the world.In the spring of each year, this rich Bokkeveld area erupts into colour as the myriad bulbs and wild flowers bloom, carpeting the earth in bright pinks, lavish purples and summery yellows as far as the eye can see. While this area spends much of it's year as a hot, dry and barren land, it comes to life as the winter chill recedes from the mountains and the late rains nourish the ground.The Bokkeveld, Boesmanland, Hantam and Knersvlakte regions all converge here, and these four unique plant biomes create a botanical marvel that enjoys world wide recognition. The varying vegetation, height above sea level and fluctuation in precipitation create a huge number of micro habitats as well as some magnificent landscapes. 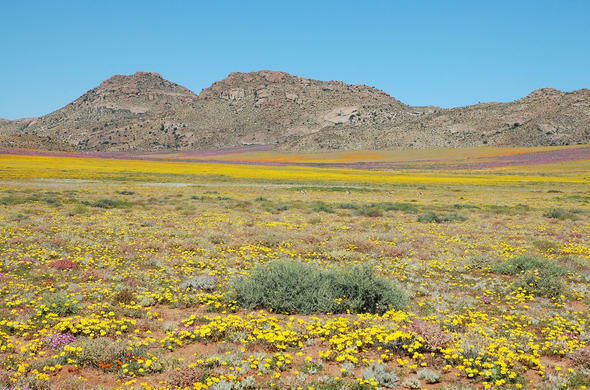 Each year the wild flowers appear from late March to October, and peak in August and September.In the centre of this floral phenomenon lies the historical settlement of Nieuwoudtville, the base from which to explore the numerous other attractions in the area. Besides the obvious appeal of the flowers, the town and surrounds are known for their hospitality, vast vistas and the spectacular Nieuwoudtville Falls on the nearby Doring River. Bird watching, hiking, cycling, rock art and historical sites abound, and apparently the lamb from the local butchery alone is worth the four hour drive from Cape Town.Nieuwoudtville itself is a quiet little farming hamlet, consisting of little more than a cluster of low buildings around a dusty main road and beautiful sandstone church, which was built shortly after the Anglo-Boer war in 1906 and is now an historical monument. Extensive sheep farms surround the town, stretching out across the low, rugged hills and wide valleys.The local Van Zijl family owns much of what you see in and around the town - guesthouses, the Smitswinkel Restaurant, farms and the Olive Camping and Caravan site all have the Van Zijl name associated with them. During our recent visit to the area the camp site was our choice of accommodation, which was an experience in its own right. The sites are nothing more than small demarcated areas in Hendrik van Zijl's quaint farmyard, and whilst clean and functional, certainly are rustic. While our stay was made less than ideal due to the arrival of a nasty cold front and fact that we had brought our tent with us but had overlooked the corresponding and somewhat essential poles which were still lying at home in Cape Town (thank goodness for my trusty camera tripod), we enjoyed this unique camping experience. A word of warning though - take a set of good earplugs if you don't want to share the crack of dawn with the noisy gaggle of geese and a number of rather vocal resident roosters. Starting with a warm meal at the Smitswinkel Restaurant and a browse through the information office and library, we set out to discover just what made Nieuwoudtville such a tourist Mecca. The restaurant is housed in a large sandstone building which, many years ago, was occupied by the last blacksmith at Nieuwoudtville. It is warm and inviting and offers traditional farm style meals and local dishes. Its walls display one of the most complete collections of antique blacksmith tools in South Africa. A vast collection of Clivias is housed in the garden. There are large maps against the walls, and there are numerous reference books on the geology, flora and fauna of area. During the flower season owner Hendrik Van Zijl gives a talk every evening about the flora, the bulbs (of which he is an expert), the weather, the geology and what you can expect to see the following day. Every year an unimaginably vast number of flowers sprout, bloom, set seed and die. The fact that they do this so enthusiastically make people come from all over the world to watch and marvel. In essence it's a combination of geography, limited rainfall, natural selection, soil type, climate and a good dollop of inaccessibility that causes the bloom, but to the casual observer it certainly seems an impressively brave and defiant show of strength in an otherwise harsh environment.Brunsvigia Bosmaniae (a bright purple flowering bulb) is without a doubt one of the world's greatest floral spectacles. Unfortunately this particular mass flowering is extremely difficult to predict and does not necessarily occur every year. The trigger that causes the bulbs to flower is a heavy downpour of rain in February or March. Almost to the day, exactly three weeks after that downpour, the flowers will be fully open. The reason for the unpredictability of the bloom lies in the fact that although Nieuwoudtville has a Mediterranean climate (dry summers and wet winters) the triggering factor for flowering is a late summer spill-over of rain from the neighbouring summer system, which does not occur every year. Personally this was the highlight of my trip, and I found myself drawn back here on a number of occasions, camera in hand. The largest and the most southerly colony of Aloe dichotoma - one of South Africa's giant aloes - occurs approximately 25 km from Nieuwoudtville just off the tarred road to Loeriesfontein. This aloe grows almost exclusively on hot north facing slopes and flowers in June/July.The ancient Bushmen in the area used the branches for their quivers of arrows, hence the local name of Quiver tree. In this particular colony, which covers a dramatic koppie (flat topped, rugged hillock), there are thousands of plants. In the early morning and late afternoon the trees are silhouetted against the craggy hillsides and the impressive view resembles some weird prehistoric scene. The shape, textures and soft variety of pastel colours makes for truly spectacular photography. If you enjoy climbing, the very peak of the koppie is a rather invigorating place to strip down and stand naked if you are so inclined (and if there is no one else around, of course). The Nieuwoudtville waterfall is surprisingly impressive, and the main waterfalls sudden and dramatic size caught us by surprise. The river seems small and the first set of falls could be described as "cute" but is nothing out of the ordinary. But around the corner and hidden by the low brush, the river suddenly disappears down a massive drop into a deep, inhospitable gorge, forming a truly magnificent waterfall. The views from the various view points are majestic, and you start feeling that strange desire to leap off into the abyss. The falls are only 5km from Nieuwoudtville, and definitely worth a visit. The nearby Oorlogskloof Nature Reserve offers excellent hiking trails, especially for bird watching enthusiasts. The Northern Cape Department of Nature Conservation runs this reserve and permits are required to enter (these can be obtained at Nieuwoudtville). They have printed an excellent brochure and map of the reserve. Be warned, these trails are not a stroll in the park, so go prepared for a proper hike. This local landmark dominates the skyline and is built of dressed sandstone quarried just outside Nieuwoudtville. The oak pews, wrought-iron railings and the magnificent pressed ceiling were all transported by ox-wagon from Piketberg, which was then the end of the railway line running north from Cape Town. One of the many outstanding features of this church must surely be the pulpit, built of pristine white sandstone that has not bleached or discoloured over a period of more than 100 years. The Oorlogskloof glacial floor is just south of Nieuwoudtville on the road to Botterkloof Pass. According to the Geological Society of South Africa, the highly visible striations in the rocks were laid down 300 million years ago when glacial conditions prevailed over Southern Africa. To the north and south of Nieuwoudtville, hugging the escarpment over a distance of almost 100 km, are the remains of the homesteads and outbuildings of the early pioneers and farmers who settled in this area. We explored a few of these but weren't overly impressed at what we saw. Overall, Nieuwoudtville has far more to offer than a casual glace at the town would suggest. But while some of the sights we visited didn't live up to the sometimes overly enthusiastic write ups we had read whilst doing our research on the area, the flowers, waterfall and quiver tree forest certainly made up for any shortcomings in other departments. The flowers alone are a phenomenon definitely worth seeing, and if you happen to time the rains just right you could really be in for a sensory overload of colour.